After surgery, medical staff will help the patient get up and walk as soon as possible. The process of healing depends on the overall the health of the patient. Usually, it will take 3 to 5 days for the patient to be discharged. A doctor may recommend patient to use a walking frame or crutch to walk, such that not much pressure is exerted in the knee. Typically, the patient can walk with a stick, one week after surgery. Prior to discharge, the patient will be educated on some basic exercises by the physiotherapist to help in the healing of knee and getting strong. Make sure patient takes medication on time. It is good to visit a doctor during appointments and get advice on medication. You will learn how to monitor medication for warning signs of inflammation, swelling or fluid build-up. Consult a doctor if symptoms persist. Healing will also depend on exercise. Sometimes, the patient may sense discomfort and wish to skip exercise. But doctors may insist that patient do exercise even when he is not up to it. But if the patient is in distress, consult a doctor immediately. Keep track of patient while she is exercising. The wound of the surgery must be carefully taken care of, to avoid infection. Keep the spot of incision dry, like till staples and pins are removed. This may take two weeks. But inform doctor in case of any swelling or redness. Eat healthy and fresh food like whole grain items, low-fat dairy, lean meats, etc. Move rugs, furniture, electrical cords, out of the way of the patient. Do dusting and mopping much before surgery. Install handrails, raised toilet seat, ramps in outdoor steps, change the texture of slippery floors, wear non-skid socks, install night lights and use walking devices till you are stable. Arrange comfortable seating spot for spending all your time for recovery. Keep all things like reading glasses, cell phone, TV remote, water, etc. in easily reachable location. In case you need to deal with steps to reach your bedroom, make alternative arrangements for sleeping in your home. 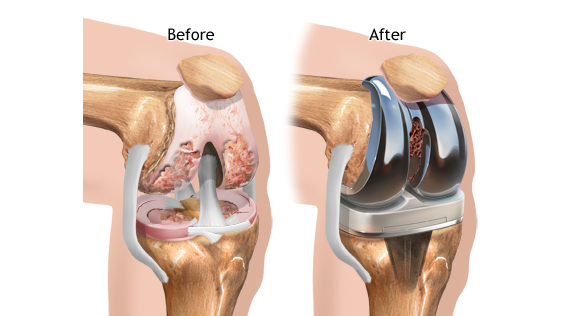 These are all some tips on how to prepare for recovery after knee-replacement surgery.